I am not an economist, so I will not attempt to define money except to say that it allows us to trade without a direct exchange of goods (barter). Some form of monetary exchange has been developed by all societies as they adopt technologies and sophisticated levels of trade. Some cultures have used beads or shells as currency. Modern societies use metal, paper or plastic money and, increasingly, simply trade with figures over the Internet. On this page I will be examining some different denominations of money from around the world … some current, and others historical. The image at left is of Australian bank notes (since I live in Australia). They are colourful and made of plastic. As time permits, I will be adding information about others. I will also be discussing matters such as cost price, profit, selling price, simple interest, compound interest, annuities, income, taxation, budgeting, etc. Britain adopted metric currency (the New Pence) in 1971, so there are now 100 new pence in one pound sterling. 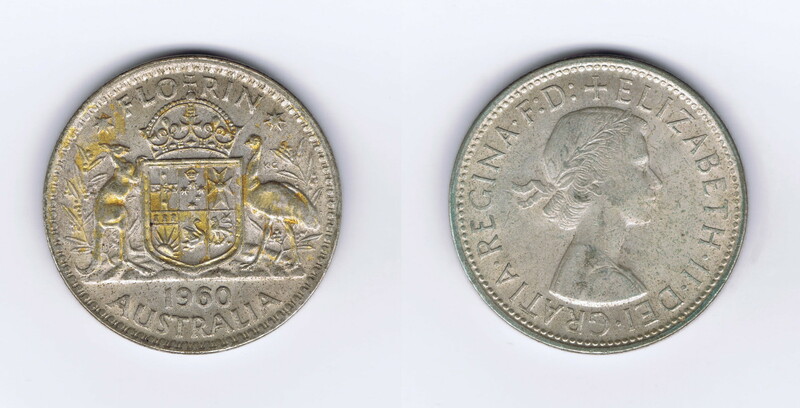 Here in Australia, our currency was decimalised in 1966. I then show how two monetary amounts would be added in those days. In this way we can further see how place value and the concept of base arithmetic governs our understanding of how to 'bundle' figures together. As well as learning some mathematics, you will learn what a labourer's daily wage was in the days of the Roman Empire, why people in the army are called soldiers, where the dinar and lira came from, and why the slash symbol under the question mark on your keyboard is called a solidus. 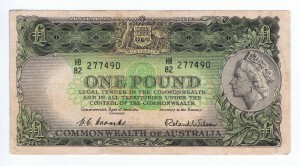 If you are interested, here is a selection of my own images of pre-decimal Australian currency. I remember using pounds, shillings and pence as a child. 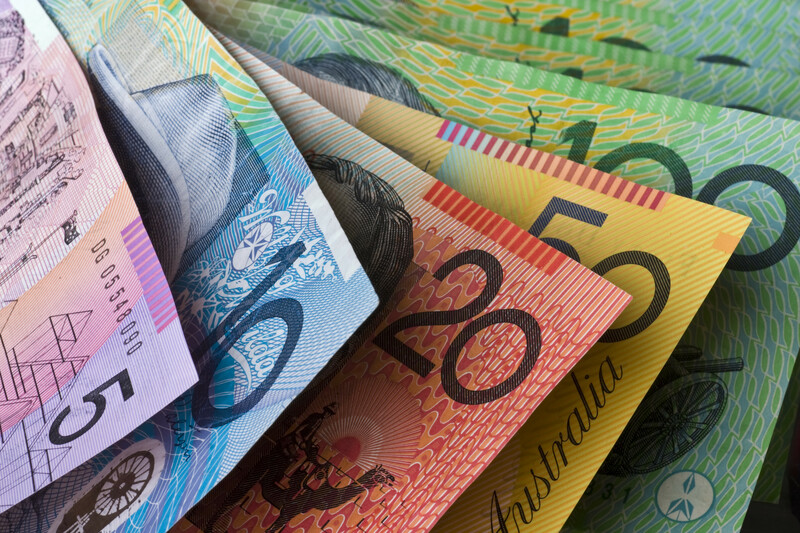 At one stage I saved my pocket money of sixpence per week for a long time until I had over one pound ... and I spent most of it on sample bags at the Royal Queensland Show in Brisbane (was it the Royal Easter Show back then?)! Sample bags in those day contained more than the retail value of their contents. They were intented to show off the wares of different companies and treated as an advertising exercise rather than an opportunity to make money, so they were very worth buying. I think they were about a shilling each back then (perhaps less). I will start with the coins. Collectively, loose change in one's pocket was referred to as schrapnel (no doubt influenced by soldiers' slang from two World Wars). Obviously two halfpennies were equal in value to a penny. From 1911 to 1936 halfpennies were minted with George V on the obverse and an annulus-pattern on the reverse. From 1938 to 1939 halfpennies were minted with George VI on the obverse and an annulus-pattern on the reverse. From 1939 to 1952 halfpennies were minted with George VI on the obverse and a kangaroo on the reverse. From 1953 to 1964 halfpennies were minted with Elizabeth II on the obverse and a kangaroo on the reverse. The coins pictures here date from 1911, 1936 and 1938. The penny was 12th of a shilling. One had to save 240 of them in order to have one pound. Australian pennies were introduced in 1911 and minting was discontinued in 1964. From 1911 to 1936 pennies were minted with George V on the obverse and an annulus-pattern on the reverse. From 1938 to 1952 pennies were minted with George VI on the obverse and a kangaroo on the reverse. From 1953 to 1964 pennies were minted with Elizabeth II on the obverse and a kangaroo on the reverse. The coins pictured here date from 1916, 1935, 1952 and 1953. The three-penny coin was often referred to as a trey, the slang apparently deriving from the French trois (three). 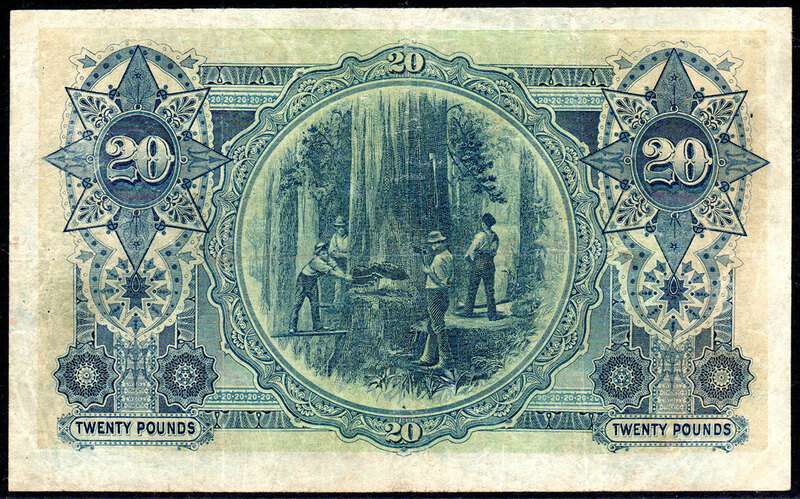 Threepences were minted from 1910 to 1964. 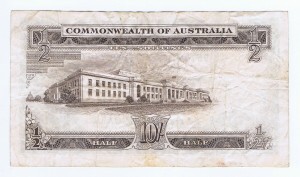 The 1910 threepence had Edward VII on the obverse and the Australian Coat of Arms on the reverse. 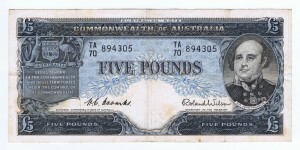 From 1911 to 1936 threepenny pieces were minted with George V on the obverse and the Australian Coat of Arms on the reverse. 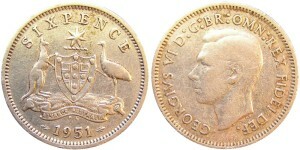 From 1938 to 1952 threepenny pieces were minted with George VI on the obverse and three stalks of grain on the reverse. From 1953 to 1964 threepenny pieces were minted with Elizabeth II on the obverse and three stalks of grain on the reverse. The coins pictured here date from 1925, 1949 and 1955. Sixpence was worth half a shilling (12 pence). I remember that people referred to a sixpenny piece as a zack. It was sufficient to purchase an expensive (quality) ice cream. Would you like to know some interesting trivia concerning these coins? 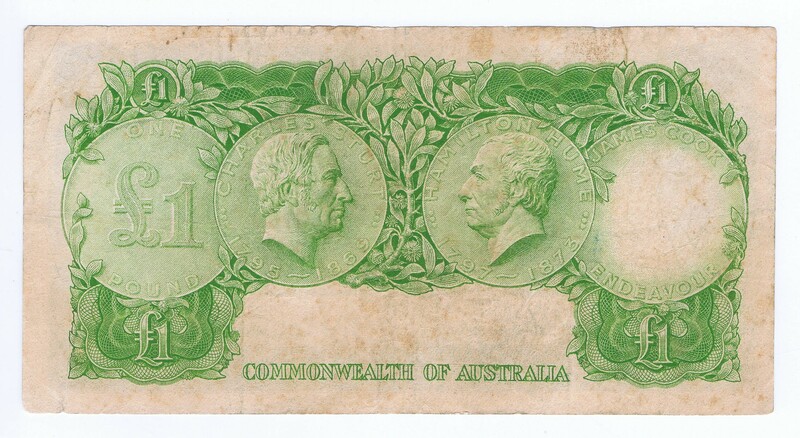 They were the only pre-decimal Australian coin that never had the design on its reverse altered. 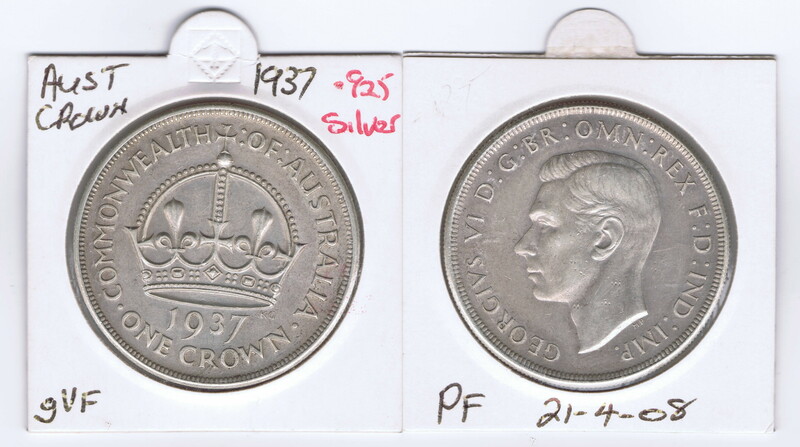 This is fascinating, considering that the Australian coat of arms was modified in 1912 (to remove the Advance Australia ribbon), but the coins continued to bear the obsolete version until their last minting in 1963! Not only that, but during some of the World War II years (1942 to 1944), two branches of the US Mint supplemented our coin production. Those that were struck at the San Francisco mint (1942–1944) carry a small S below the coat of arms, and those struck at the Denver mint (1942–1943) have a small D in the same location. After decimalisation on 14 February 1966, the sixpence continued to circulate at the value of 5c for some years, along with new 5c coins of the same size and weight. The 1910 sixpence had Edward VII on the obverse and the Australian Coat of Arms on the reverse. From 1911 to 1936 sixpenny pieces were minted with George V on the obverse and the Australian Coat of Arms on the reverse. 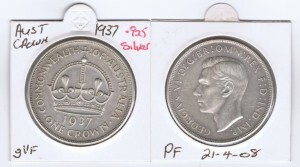 From 1938 to 1952 sixpenny pieces were minted with George VI on the obverse and the Australian Coat of Arms on the reverse. From 1953 to 1963 sixpenny pieces were minted with Elizabeth II on the obverse and the Australian Coat of Arms on the reverse. The coin pictured here dates from 1951. The one shilling piece was known by its slang term, bob. I only heard the term shilling in more formal settings. It was much more common to hear an adult (I was a child then) speak of something that was going to cost 'five bob' for example. I used to hear expressions like "he's as silly as a two bob watch." Two bob, in those days (1950s and 1960s), was used in much the same way as "two bit" in US slang ... for something cheap and unreliable or unpredicable. I was involved in the Scout movement back then and we had Bob-a-Job Week each year where we would door-knock and perform odd jobs for people in return for a donation for the local scout troop. In this way I met a WWI veteran who was in a wheelchair as a result of a bullet injury to his spine and we had a number of long conversations about "life, the universe and everything." I am not sure if he befriended me or I befriended him. I seem to recall that it cost about a shilling to go to the movies as a youngster. I can't remember whether the ticket was a shilling and an ice cream was an extra sixpence, or whether the ticket plus icecream added to a shilling (I didn't go to the movies very often). 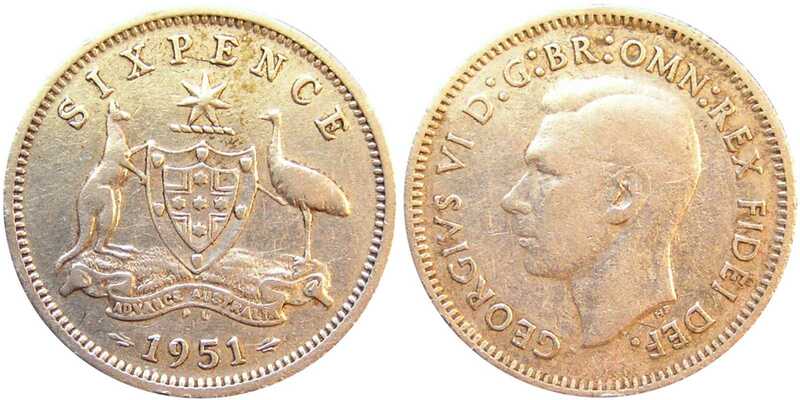 The shilling coin was minted from 1910 to 1963. During a few of the World War II years (1942 to 1944), some of the coins were produced at the San Francisco (USA) mint. They have a small S below the ram's head. The 1910 shilling had Edward VII on the obverse and the 1908 Australian Coat of Arms on the reverse. 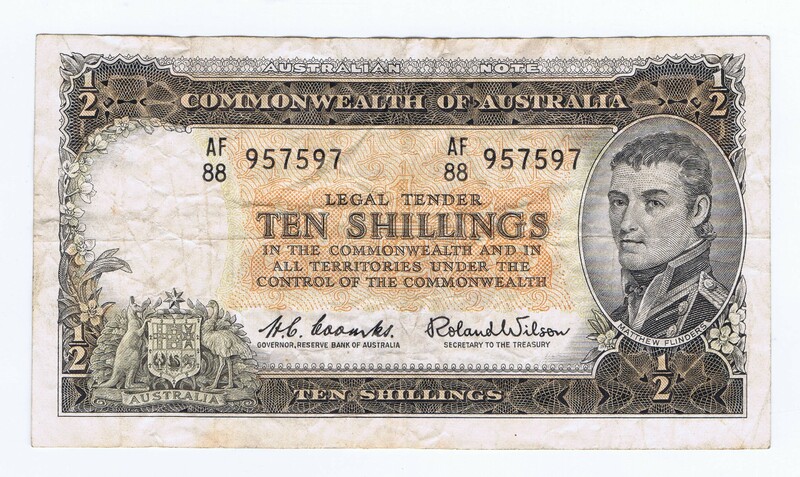 From 1911 to 1936 shilling pieces were minted with George V on the obverse and the 1908 Australian Coat of Arms on the reverse. 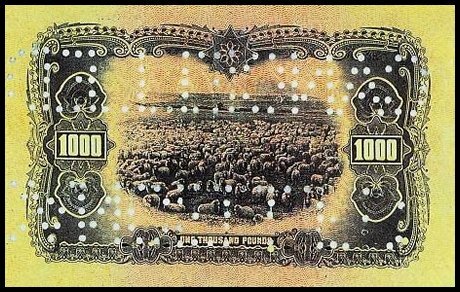 From 1938 to 1952 shilling pieces were minted with George VI on the obverse and a merino ram's head on the reverse. 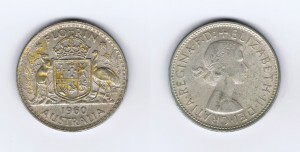 From 1953 to 1963 shilling pieces were minted with Elizabeth II on the obverse and a merino ram's head on the reverse. The coins pictured here date from 1952 and 1959. This coin was usually referred to as "two bob" or, sometimes, a florin. The florin was minted from 1910 to 1963. During a few of the World War II years (1942 to 1944), some of the coins were produced at the San Francisco (USA) mint. They have a small S below the coat of arms. 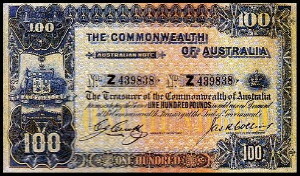 The 1910 florin had Edward VII on the obverse and the 1908 Australian Coat of Arms on the reverse. There was a 7-pointed star above the Coat of Arms and Southern Cross (Constellation) on the shield. 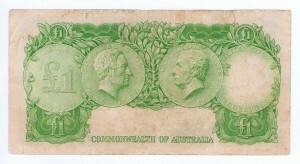 From 1911 to 1936 florins were minted with George V on the obverse and the 1908 Australian Coat of Arms on the reverse. These also had a 7-pointed star above the Coat of Arms and Southern Cross (Constellation) on the shield. 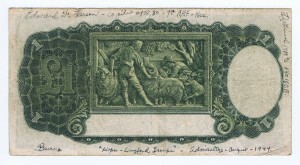 From 1938 to 1952 florins were minted with George VI on the obverse and a merino ram's head on the reverse. These had a crown above the Coat of Arms, the six states represented on the shield, and golden wattle (plant) as a background. 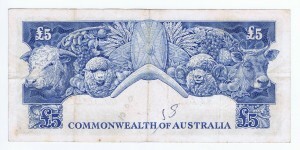 From 1953 to 1963 florins were minted with Elizabeth II on the obverse and a merino ram's head on the reverse. These also had a crown above the Coat of Arms, the six states represented on the shield, and golden wattle (plant) as a background. The coins pictured here date from 1931, 1951 and 1960. The crown was only minted in 1937 and 1938 and it was originally going to be a coin commemorating the ascension of Edward VIII. When he abdicated, however, it was struck to commemorate the ascension of George VI instead. It transpired that people did not use these coins a great deal in their daily transactions, so they were discontinued. 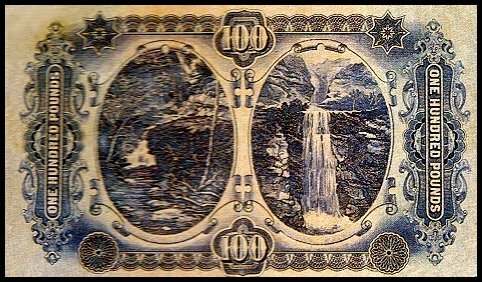 Their uniqueness, high silver content, and small mint runs (1,008,000 in 1937 and 101,600 in 1938) make them popular collectors' items. In some circles crowns were referred to as Casey's Cartwheels since it was the Australian treasurer, Lord Casey who proposed that the coins be minted. 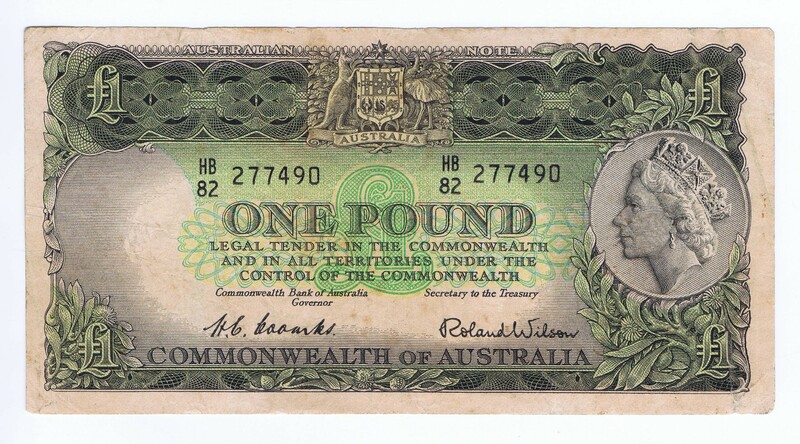 The 10/- (half pound) banknote was first issued on 1 May 1913 as a blue banknote payable in gold. It was the world's first officially issued ten-shilling note. 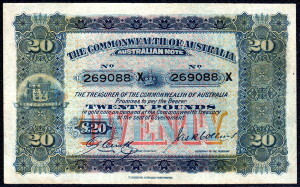 The note below is the last design issued (with the signatures of H C Coombs and Roland Wilson). It had three print runs, in 1952, 1954 and 1961. 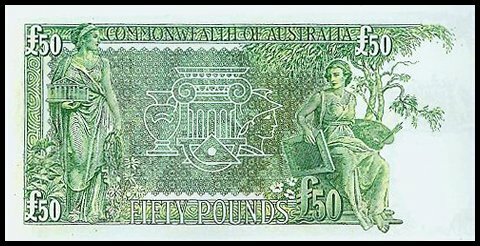 The 1961 print run was the last before decimalisation of the currency in 1966. 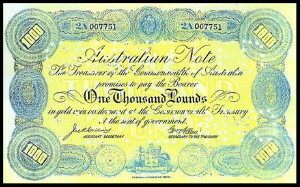 The common name for the one pound note in Australia when I was growing up was quid. 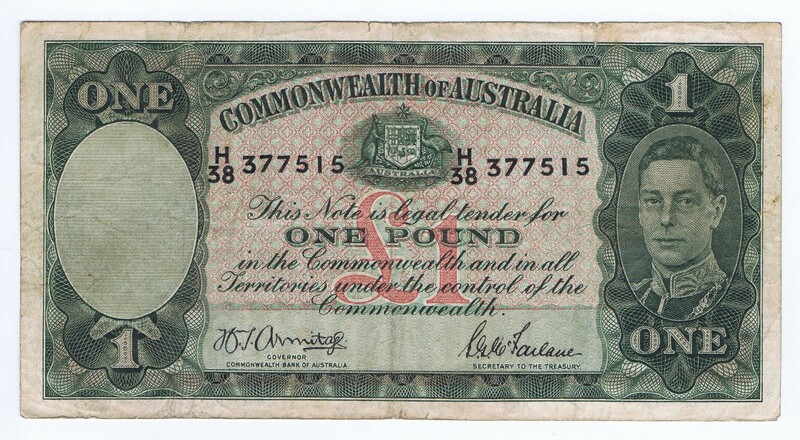 The term pound was used in more formal conversation. It was very common to hear of things costing "two quid" or "five quid." Just a few years after decimalisation of our (Australian) currency, I was studying at university. My part-time job was serving petrol at a service station. Even then, older drivers would invariably ask for "a quid's worth" of petrol (meaning $2 worth). This was at a time when petrol was less than 30 cents per gallon (4.5 litres)! It is now (in 2015) about $1.50 per litre (or about $6.75 per gallon). 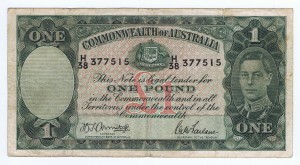 These notes were printed from 1913 to 1952. 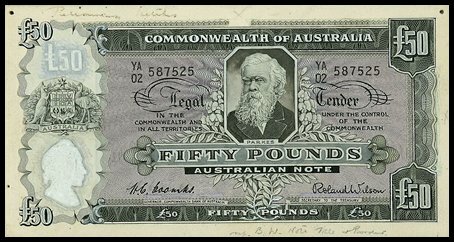 Despite the last print run's being in 1952, sufficient notes remained in circulation until decimalisation of the Australian currency in 1966. 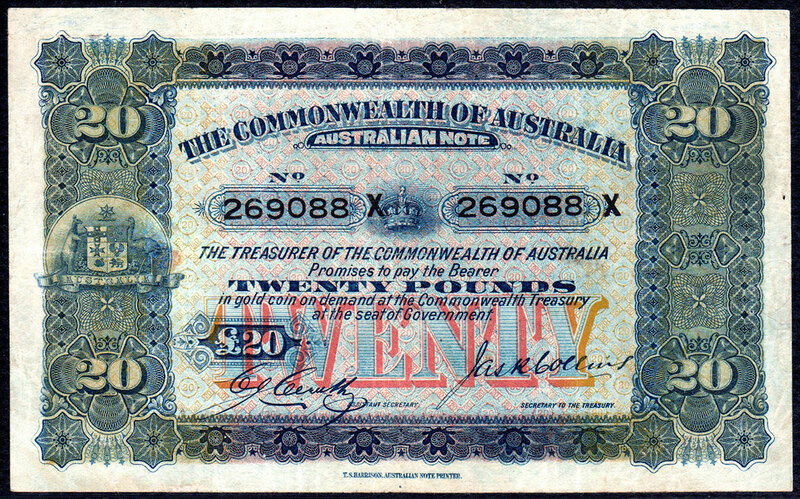 Recently (May 2015), the first Australian £1 banknote ever printed (serial number P000001) was found in uncirculated condition in the Australian National Library. 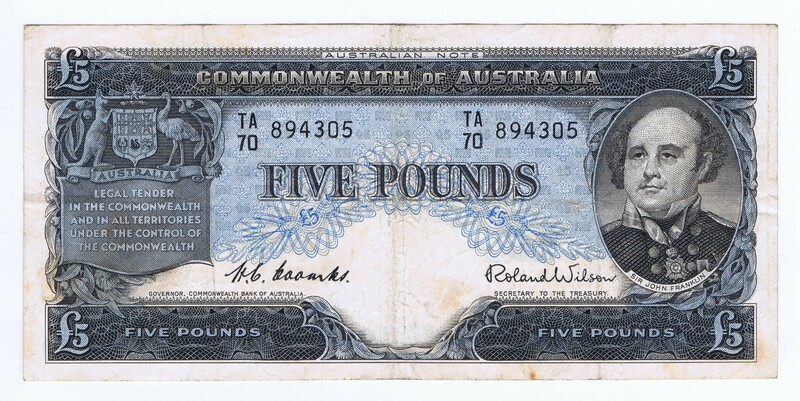 It was the first piece of currency to carry the Australian Coat of Arms. The note below is from the 1942 print run (during World War II). It bears some hand written notes from a serviceman in WWII. The reference to 9th A.A.F. appears to be to the 9th Army Air Force of the USA. Edward F Larson - copilot #128,30 - 9th A.A.F. - Rec. J (or T) W Linnel MM nc 140 No C.5. If you can shed any light on these details I would love to hear from you. 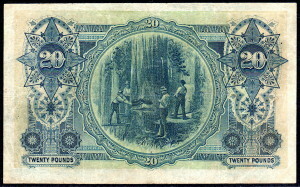 This second note dates from the last print run in 1952. When I was a child, the five pound note was commonly referred to as a fiver. These notes were printed from 1913 to 1961 (despite the Wikipedia article's only dating them to 1939). The note depicted below appears to be from either the 1954 or 1961 print run (I am not an expert in these matters). I never heard any slang term for a ten pound note as a child. I guess, by the time people were spending that sort of money (it bought a lot back then), it was all formal speech! So, the note was simply referred to as "ten pounds." Ten pound notes were printed from 1913 to the 1960s (I cannot ascertain the last year of printing). 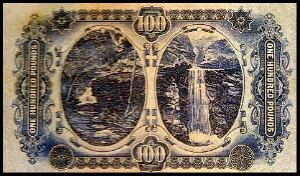 The note depicted below was printed in 1952 or later. This would explain why I never saw one and why they are so rare and highly prized as collector's items today. I have found some representative images of these notes from the Internet and include a sample here. 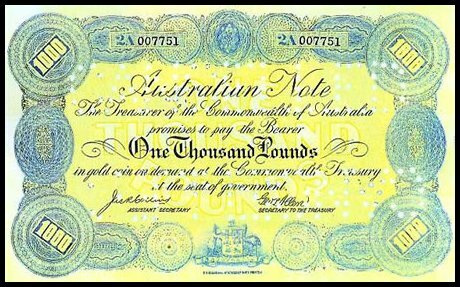 Australia adopted decimal currency on Valentine's Day (14 February), 1966. I was in my final year of primary school and still remember the jingle on television (my parents had recently purchased a tv set for the home). The tune was Click Go the Shears ... and the character Dollar Bill explained the new coinage. I found a coloured version of the advertisement on YouTube for you to view (below) but everyone had black-and-white sets in those days. Please notice that even the official government advertisement had Dollar Bill drawn incorrectly. Usage has changed a bit during the last forty or more years, but I distinctly remember being taught at school that the Australian Dollar sign was to be drawn with one vertical stroke ($), while the US dollar had two vertical strokes ( ).